Since we are in Jerusalem, where many of the Eastern Catholic Churches converge, I decided to share this excellent article. I found it very helpful. Many think the name of “our church” is the “Roman Catholic Church” — but that is only the name of the Latin Rite of the Catholic Church. The “Catholic Church” is the simple and actual name of our Church, a church made of many different rites, all with the same sacraments and all loyal to the Bishop of Rome as the visible head of the Catholic Church. 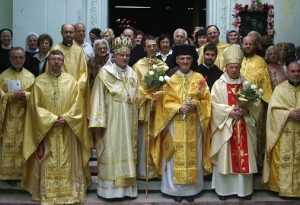 But many others of the Eastern churches are not “Catholic” and are not in union with Rome such as the Greek Orthodox, the Russian Orthodox, Coptics and many others. I hope you find this explanation, list of the various rites, glossary of terms and more as helpful as I did. Greetings from Jerusalem where the Roman Catholic Church is referred to as the Latin Rite and cooperates with many other Catholic Rites and co-exists with many non-Catholic Eastern rites. 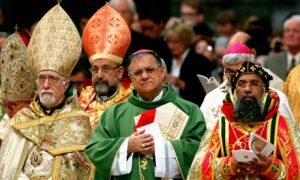 “As millions watched the funeral for Pope John Paul II, many were confused by the concluding Panakhyda celebrated not in Latin, but in Greek and Arabic by hierarchs in black hoods, turbans, crowns, and unusual vestments. Was this not the responsibility of the cardinals? And were those clerics even Catholic? “The answer may surprise you, as Catholics are generally unaware that they have millions of coreligionists who are not themselves part of the Roman Catholic Church. Indeed, even the term “Roman Catholic” isn’t quite right it was actually a derogatory label assigned to us by Anglican Protestants, trying to legitimize their own use of the term “Catholic” over and against that foreign Church loyal to the pope of Rome. “In point of fact, the Catholic Church directly under the jurisdiction of Rome is properly and canonically termed the Latin Church. All official Church documents simply use the term, “Catholic Church.” And contrary to popular belief, most of the day-to-day work preformed by the Holy Father is not in his role as pope and pastor of the Universal Church but in his position in the Latin Church as the bishop of Rome and the patriarch of the West. “So who are these “other” Catholics? They have their own hierarchies and liturgies, as well as their own distinct apostolic lineages. 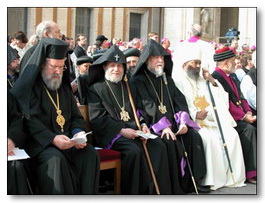 They may look and act like Eastern Orthodox churches, but they recognize the pope of Rome as the head of the visible Church on earth and have suffered for the cause of that unity. “Meet the Catholic Churches. There are more of them than you think… For the whole article, click here. Steve, can't "click here" to get the whole story …..and would like to see it! Something is wrong with the link or lack thereof. Just wanted to let Steve know the hyper link for the full article on this piece is broken. We have a Greek Orthodox Church near us that had a huge salad bar luncheon the other day. My friend and I attended it and took a peek at the church itself. It looks very Catholic in the architecture and layout and beautiful art and seemed to be very much a holy place. They had an altar and a tabernacle like ours as well as many icons of Mary and the Saints. I asked someone who would know: If they were not under the authority of the Pope, would that make their Eucharist and priesthood invalid? He said that the Eucharist and the priests were valid as was their liturgy. Does that mean they can come to any Catholic Church and receive the Eucharist and vice versa? Inquiring minds want to know…..
STEVE RAY HERE: their sacraments are valid but they are not allowed to take Catholic sacraments and we can only take theirs if there are no Catholic Church is available. It is too bad but the divisions exist. @Steve Ray: "…and we can only take theirs if there are no Catholic Church is available." Anyone who is not in communion with the Orthodox cannot partake of the Holy Eucharist offered at an Orthodox Church. This includes any Roman Catholic or Eastern Catholic in communion with Rome. As you so aptly said, "It is too bad but the divisions exist." And before anyone can say that the forbidding of the Eucharist to anyone who is not Orthodox is uncharitable, this has been part of Holy Tradition since the beginning. Hear St. Justin in his First Apology, cir. 150 AD, chapter 66: "And this food is called among us ?????????? [the Eucharist], of which no one is allowed to partake but the man who believes that the things which we teach are true, and who has been washed with the washing that is for the remission of sins, and unto regeneration, and who is so living as Christ has enjoined." This would also justify Rome's position to not allow non-Catholics to partake of the Holy Eucharist she serves. STEVE RAY HERE: I agree with most everything you say here but you are incorrect about Catholics sharing in orthodox communion.